Click HERE to see a size comparison with a pen. These deerskin cradle boards are made by Navajo artisan Lenora Johnson in New Mexico. The cradle boards are approximately 5.5" long and 3" wide. 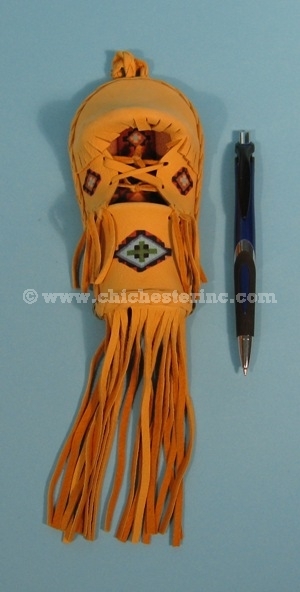 It is made out of deerskin leather. It weighs approximately 83 grams. A U.S. Fish & Wildlife export permit is required for all shipments outside the U.S.